Leatt Hard Shell Elbow Guards/Pads ,used a couple of times have just sat at the bottom of MX bag ,these are in very good condition they are like new. Leatt 3DF Hybrid EXT Knee Shin Guards in Black - Leatt Motocross Enduro Body Protection. Leatt 3DF Knee & Shin Pads Hybrid RRP £95.00! This hard- shell, extended length knee and shin guard with soft 3DF impact foam promise comfort paired with premium protection. 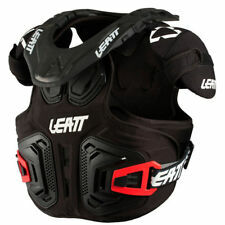 Leatt 2.5 Chest Protector Body Armour Brace Motocross Off Road Enduro White. Used for 1 season and still in excellent condition. We believe that the 5.5 neck brace is truly the most technologically advanced neck brace in the world. The core of what makes our neck braces work is Alternative Load Path Technology (ALPT®) and for the ALPT to work optimally neck braces must fit correctly. Leatt Neck Brace Adventure Kids /youth . Condition is Used. Comes in original box with all fittings and user manual. leatt Mx Enduro Protector. Condition is Used. They cover the knee, even when fully bent, as well as the lower thigh and most of the lower legs. Great levels of impact protection are proven by the CE impact safety standard they are certified to. 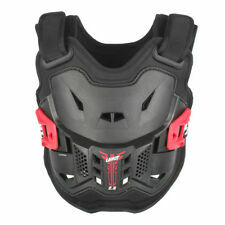 Leatt Chest Protector 2.5 in White CE Safety Approved- Leatt Motocross Enduro Body Protection. CE tested and certified, it scores a total of 3 points in the Leatt protection system. For your convenience, it is compatible with Leatt neck braces. Leatt 3DF Motocross MX Off Road Kidney Belt​ Adults XXL XXXL 40"-44"
Leatt 3DF Motocross Kidney Belt. 3df foam for impact protection. THE ONLY Impact tested and ce approved Kidney belt certified to 1621-1. Knee & Shin Guard 3DF Hybrid EXT Wht/Blk Junior. This hard-shell, extended length shin and soft 3DF impact foam knee give the unbeatable combination of comfort and premium protection. Soft and Hard-Shell Knee and Shin Guards for Juniors with Extended Length.